The President of Azerbaijan Ilham Aliyev chaired a meeting on March 28 in regard with a fire that occurred in a shopping center in the Nizami district of Baku. "Fortunately, no human casualties reported during a fire in the shopping mall on March 26. However, the fire destroyed financially the entrepreneurs and many people lost their jobs. The investigation into the reasons behind the shopping mall fire is ongoing and relevant measures were taken to address the problems of entrepreneurs", President Ilham Aliyev noted. 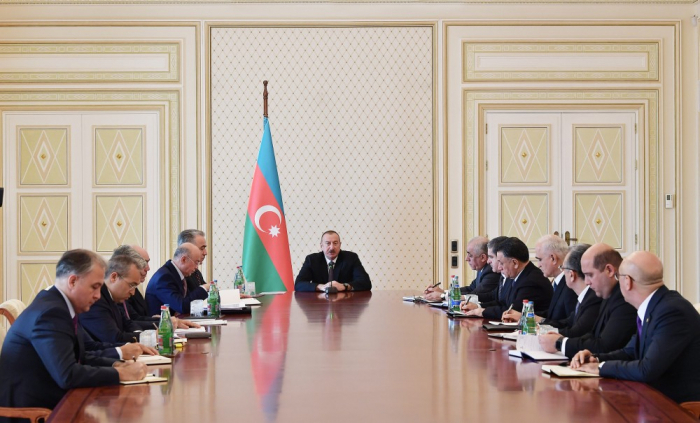 President Ilham Aliyev also touched on the meeting with the entrepreneurs held in Nizami District Executive Power highlighting that they would be supported by the state. "The Ministry of Economy should meet with entrepreneurs and listen to their problems. Ministry of Finance has to allocate financial resources and these resources should be given to entrepreneurs. Other public agencies should also work with business owners in order to clarify the cost of damage by fire". Then Minister of Emergency Situations Kamaladdin Heydarov, Prosecutor General Zakir Garalov, Interior Minister Ramil Usubov, Minister of Economy Shahin Mustafayev and Head of Nizami District Executive Power Arif Gasimov reported.